Posted May 28, 2015 by Emily Contador-Kelsall & filed under Inner West Independent. Marrickville Council officially declared their opposition to the contentious WestConnex project at last week’s council meeting, a move that the WestConnex Action Group labelled “a great win for grassroots resident groups”. This vote came a week before revelations that the WestConnex project will not ease congestion based on the state government’s modelling. Marrickville Council has become the third council to stand against the state government’s WestConnex project, joining the City of Sydney and Leichhardt Council, who have both strongly opposed the tollway. Marrickville mayor Mark Gardiner said council had long held the view that WestConnex was bad for their LGA and for the city as a whole. He called on Premier Mike Baird to sack Duncan Gay as Roads Minister this Wednesday May 26, after secret government documents revealed that congestion on roads will continue to worsen after the project is complete. “The WestConnex interchange at St Peters is going to result in a least 31,000 vehicles a day entering and exiting that portal,” he said. 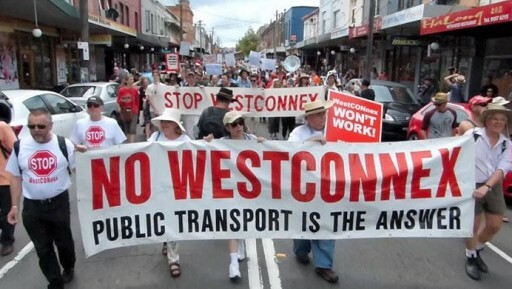 Opposition to the WestConnex project is robust across Sydney, with numerous resident groups regularly staging protests. 1,500 residents walked from Newtown to Sydney Park earlier this year in opposition to the proposed interchange at St Peters, and Greens spokesperson for WestConnex Jenny Leong has been an active campaigner against the project. In a statement release on Wednesday, Ms Leong slammed WestConnex as the “nightmare on King St”. “If the government’s own modelling shows WestConnex is a dud, what has this $15 billion project got going for it besides an out-of-touch and out-of-control Roads Minister?” she said. The City of Sydney has also stood firmly against the project since the findings of a council-commissioned SGS Economics and Planning report were released this year. The report found that WestConnex was not an appropriate transport solution for Sydney, and is cited as the basis for Marrickville’s opposition to the project in the mayoral minute. “We are pleased that other councils are opposing the $15 billion WestConnex, which independent research shows will not benefit Sydney,” a City of Sydney spokesperson said. Marrickville Council also voted last week to establish a special committee known as the WestConnex Advisory Committee and allocate $40,000 towards the engagement of consultants. They also called for the tender process, including home and business acquisitions, to be halted for the new M5 and M4 East. The motion passed with opposition from just two councillors. Independent Councillor Victor Macri was one of the two opposed to council passing these measures. He told City Hub that council’s measures were “premature”, as there was nothing “solid to analyse”. “I just don’t think there’s enough out there yet to analyse, that’s my issue,” he said. But Clr Macri said he was “quite comfortable” with the establishment of an Advisory Committee, as it would help council and the community better understand the information. The Advisory Committee’s initial task “would be to identify the scope of a review of issues directly affecting Marrickville LGA and public transport alternatives”, according to council minutes. Representatives from the WestConnex Action Group attended and spoke at Marrickville council’s meeting last week, urging council to support them in opposing the project. WestConnex Action Group spokesperson Garth Montgomery said it was critical that councils start to assess the impact WestConnex is going to have on their community. “It’s a long way down the path with the issue of WestConnex,” he said. Pauline Lockie, organiser of the action group, spoke at the meeting to garner council’s support and discussed the health impacts of the WestConnex tollway on the community. “Most frightening of all to people in our community is the enormous increase in deadly pollutants they’ll be breathing if WestConnex is built – both from the increased traffic on our streets, and the tunnel’s poison stacks, one of which is likely to be at the St Peters Interchange, and all of which are likely to be unfiltered,” Ms Lockie told councillors.